If you go the bottom right corner of the edit screen, your cursor will become a double arrow. This will allow you to pull the size of the writing space to increase or decrease it. The size will be the same on all edit post or page screens and will be remembered the next time you login to WordPress. If you are having trouble getting this to work properly, make sure you aren’t using an outdated version of your browser and / or try using a difference browser. It worked fine for me in Firefox. I donot know to how increase size in version wordress 3.5, So it really help me to increase size.It gives wonderful knowledge. Great tip. I actually had a hard time finding this little feature to drag the writing screen bigger. I used to have a hard time typing in the small space as I didn’t even know this was possible until a little while ago. Thanks for sharing this with us Kim. Many thanks for the tips, learned something new again. 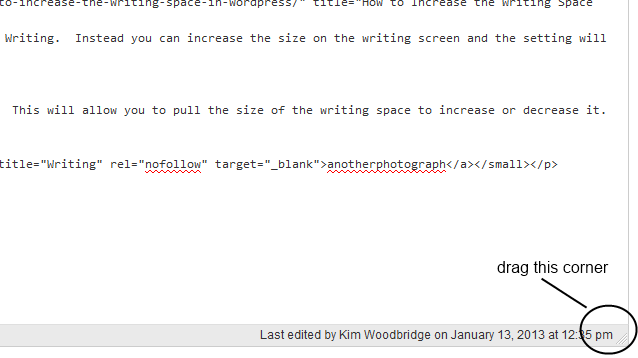 Thanks for the tip, it comes so much new in each update of WordPress that I can not keep up, my day has just 24 hours. 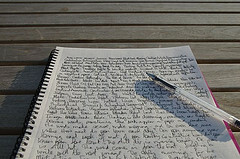 Its nice to here about you.And the tips in this article will be useful to me. I like to have your guide to my Word press projects. I really don’t know how to do it, glad you posted it here.